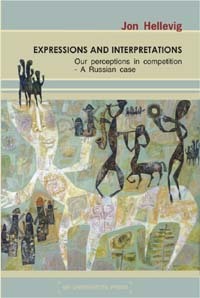 I have already in Expressions and Interpretations (2006) and All is Art (2007) announced that in my conception language is interpretation of feelings. But now I need to reformulate this statement by asserting that, in fact, it is speech that corresponds to interpretation of feelings. By making this distinction I stress the fundamental distinction between speech and language, which I account for in The Case Against Noam Chomsky. Speech (speaking) is the human behavior when expressions are uttered by articulating sound-patterns in connection with other bodily expressions. Language is the meta-perception we form of what has been expressed in speech (spoken) as part of a given speech act or in general, and what possibly can be expressed. 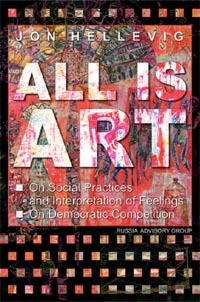 All these perception combine to the grand perception of 'language' as a name for the social practice of imitating each other's and one's own verbal behavior by way of attempting to reproduce and recombine expressions that one remembers, i.e., that one has experienced earlier (observed, heard, seen), in order to express one's own feelings. In Biological Philosophy I present a biological philosophy which represents the first true and complete unified theory of natural and social sciences showing the continuity between the biological and social phenomena of life, the latter representing reflections of the biological expressions of life. The bridge which links the social with the natural, biological, is formed by human feelings. Feelings are results of neural (mental) processing of environmental stimuli in connection with the organic system of homeostasis. The aspects of cognitive feelings which we call thoughts come about by merging the learned concepts from social practices (language practices) with biological feelings. Thoughts, embedded in less consciously developed cognitive feelings, are then expressed in form of speech and by other volitional and non-volitional symbolic means of bodily expression. The feelings expressed by one individual are in turn cognitively (organically) interpreted by other people, the corresponding neural processes affecting the body and its behavior both consciously and unconsciously. There is thus a continuous cycle between the feelings expressed by one and all individuals and the expressions pertaining to an interpretation of feelings of others. I express this idea by the paradigm of expressions and interpretations. The continuous interaction between human cognitive expressions and interpretations amounts to social practices, to all what we may refer to as the social dimension of life. Depending on our points of view, we perceive various field of social practices which, however, are always merely aspects of the general exchange of expressions and interpretations, aspects of a non-divisible social dimension of life. - Thus it is this interaction between expressions and interpretations of feelings that has created our social practices, all what we understand as human culture, and the material achievements of human culture. 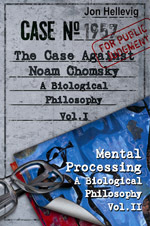 In A Case Against Noam Chomsky, I explain what is here meant by interpretation and by feelings. And I also clarify why I say interpretation and not expression, and why feelings and not thoughts.